The Elephant YIII models are equipped with a overload device to prevent overwinding. A top quality lever hoist with solid and compact design and special rust-resistant coating for extreme environment like off-shore and mining industry. The brake mechanism and the gears are completely enclosed and make the hoist highly reliable and endurable and also lower maintenance. 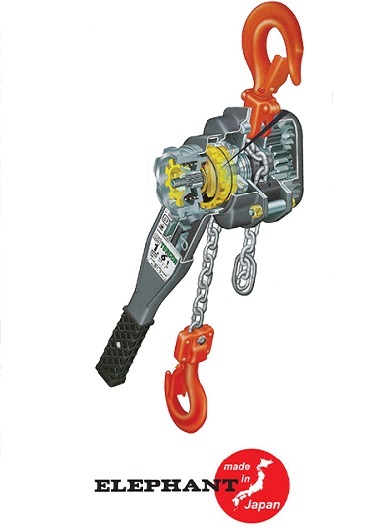 It is easy to adjust up and down operations and the length of the chain with the rubber coated operation handle. Hook with safety latch. Grade 105 galvanized load chain, which adheres to the strict German DIN 5684 standard. Free spooling, which automatically brakes when a load is applied.